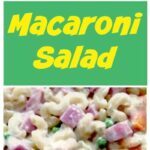 Tasty Macaroni Salad with a great Homemade Dressing. Always a hit! This delicious recipe has been generously shared by one of our Lovefoodie supporters, Dave Weigel. Dave loves to Grill and Smoke, and has loads of tasty recipes up his sleeve! 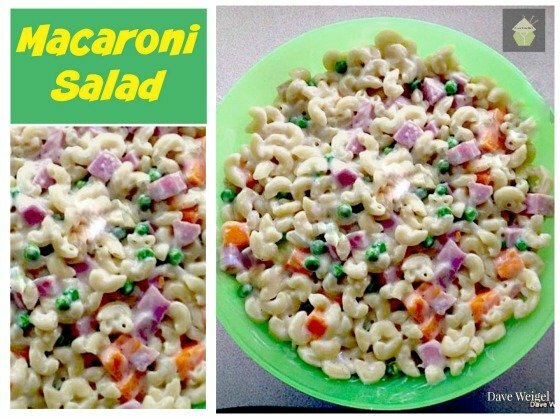 Here, Dave has created a delicious Macaroni Salad which he often serves up when he’s grilling. It’s a family hit for sure! 1. Cook the macaroni until just tender do not over cook and let cool. 2. Dice the ham and cheddar cheese. 3. Add the cheese and ham to the cooled macaroni and frozen peas. Cook the macaroni until just tender do not over cook and let cool. Dice the ham and cheddar cheese. 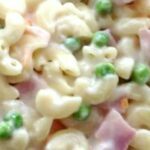 Add the cheese and ham to the cooled macaroni and frozen peas.